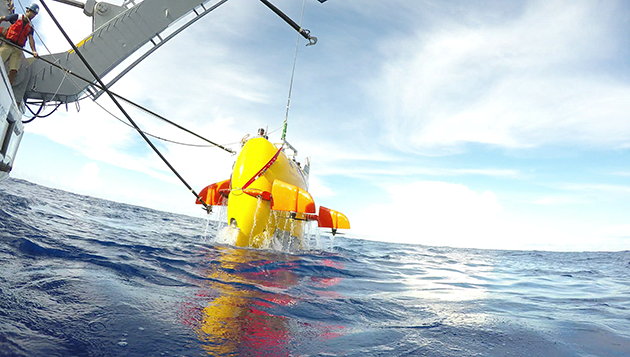 Crew launched the autonomous underwater vehicle Sentry from the stern of the BIOS research vessel Atlantic Explorer on a recent 10-day research cruise in the waters off Bermuda. The AUV was used as a platform to test a trio of oceanographic navigational instruments aimed at improving the navigation of underwater robotics used in long-term scientific investigations. Image by Nick Mathews. Last month a team of researchers from Woods Hole Oceanographic Institution (WHOI) and Johns Hopkins University (JHU) embarked on a unique scientific mission aboard the BIOS research vessel Atlantic Explorer to test new technologies while exploring the Bowditch seamuont, located 24 nautical miles northeast of Bermuda. 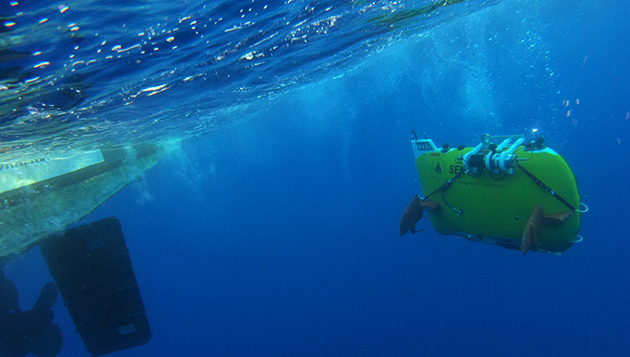 During the 10-day cruise, the team utilized the WHOI autonomous underwater vehicle (AUV) Sentry as a platform to test three oceanographic navigational instruments. These technologies are being evaluated for use on state-of-the-art oceanographic research platforms that are lower-cost and operational for longer time periods than traditional research platforms, such as large, ocean-going research vessels or manned submersibles. Sentry, about the length of a small car, is an unmanned, untethered research vehicle that performs missions of 24 to 48 hours in length for ocean exploration down to 19,685 feet (6,000 meters). The AUV is fitted with a variety of sensors, including a sidescan sonar and mass spectrometer—tools that enable it to produce maps of the seafloor as well as digital photographs of deep-ocean environments such as deep-sea vents, methane seeps, volcanoes, and seamounts. Underwater evidence of Bermuda’s volcanic past is found at seamounts—mountains rising up from the ocean floor—including the shallow Challenger seamount (located at a depth of 164 feet, or 50 meters) to the southwest of the island and the Bowditch seamount, a deeply-submerged peak north of the island. Worldwide, nearly 10,000 seamounts have been mapped to date and they remain a source of ongoing scientific inquiry due to their relative abundance, as well as their capacities to attract marine life and impact underwater currents. Louis Whitcomb, a professor in the JHU department of mechanical engineering and an adjunct scientist at WHOI, studies the navigation, dynamics, and control of robotic systems in these types of extreme environments. He’s been working to develop a specialized compass, called a “true-north seeking fiberoptic gyrocompass,” for underwater vehicle navigation. Unlike mechanical gyro-compasses, optical gyrocompasses have no moving parts, which means they are more rugged, compact, and consume less power. For underwater vehicles like Sentry that produce detailed maps of the seafloor, precise navigation is key to high quality products that scientists can then use for other research applications. In the past, AUVs like Sentry—while able to operate autonomously—benefit from fairly regular communication with their supporting research vessels on the surface through acoustic transmissions, which take place about once a minute. These transmissions allow scientists to track the AUV’s location underwater and, if necessary, retask it during operations. In practice, this means the vessel must remain above the AUV at all times, limiting the ship’s ability to conduct additional or simultaneous scientific research in the area. Capable of staying underwater for 24 to 48 hours and diving to depths of 19,685 feet (6,000 meters), the AUV is fitted with a variety of sensors and tools to produce maps of the seafloor. For underwater vehicles like Sentry, precise navigation is key to producing high quality images that scientists can use for other research applications. Image by Nick Mathews. James Kinsey and Mike Jakuba, both senior engineers in WHOI’s Deep Submergence Laboratory, along with Jim Partan of WHOI’s Acoustic Communications Group, are working together to test a pair of technologies that will allow vehicles staying at sea for months at a time—like underwater gliders—to obtain their position while still underwater. Gliders operate using very little power and currently rely on GPS position fixes obtained when they surface to determine their exact location. Once underwater, however, their position estimates degrade rapidly. Kinsey’s team is developing navigation technology that will provide a kind of “underwater GPS” for gliders. At the same time, Jakuba is investigating the use of a Liquid Robotics Inc. Wave Glider, a surfboard-shaped unmanned surface vehicle, as a stand-in for the research vessel. The idea is to connect the wave glider with Kinsey’s navigation technology, allowing the research vessel to move off-site while the wave glider stays in constant acoustic communication with the AUV below the surface. In April of this year, Jakuba successfully utilized a wave glider on a similar test mission and was able to extend the length of the research dive from 12 to 36 hours, significantly increasing the amount of data collected by the AUV on a single deployment. These projects are funded by the National Science Foundation’s Ocean Science Division’s Ocean Technology and Interdisciplinary Coordination program, which supports the development of novel instrumentation that enhance the observational, experimental, or analytical capabilities of ocean science research. The long-term goal of this particular project is to make the hours at sea on a research vessel during a funded project more cost-effective by using low-cost, long-endurance platforms, like Sentry and the wave glider, as complements to existing technologies. By improving the navigation of underwater robotics, Jakuba said they can increase the accuracy of maps, collect more precise data on the physical properties of seawater for long-term studies like time-series, and open up new scientific research capabilities for open-ocean and deep-ocean investigations.